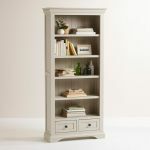 The perfect way to store and showcase your belongings, the Arlette grey bookcase is a sophisticated addition to modern homes. It's constructed from sturdy solid hardwood and finished with a crisp versatile mid-tone painted finish to give it a clean and elegant feeling. 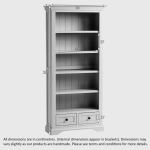 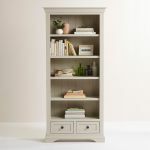 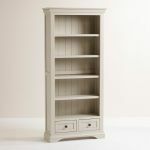 This grey bookcase is styled with decorative cornices and an arched base for classic looks, while the dark metal button handles and panelled drawer fronts bring a modern twist to the piece. Five thick hardwood shelves with safely support your favourite books, and the two drawers below, completed with durable dovetail joints safely store clutter out of sight. Don't forget to check out our full selection of other striking pieces from the Arlette range.